In May 2014 the EACB issued, in collaboration with the European think tank on co-operative banks (Think Tank on Co-operative Banking), a Call for Papers for the third EACB award for young researchers on co-operative banks. The purpose of this award is to stimulate research on co-operative banks and the fundamental role they play in the real economy. Co-operative banks play a key role in the European financial and banking systems. Half of all existing banks in Europe belong to the decentralised network of co-operative banks. While co-operative banks’ market share in the enlarged EU is about 20%. In some countries their share on deposits lies well above this figure, as is the case in Austria, Germany, Finland, France, Italy and the Netherlands. The EACB received seven applications, from three different countries and on a broad array of subjects ranging from governance models in the Italian co-operative banking landscape to co-operative banking performance and lending capacity during the crisis. Mitja Stefancic, 'Performance of Italian Co-operative Credit Banks'. 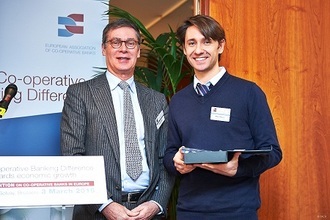 Mitja Stefancic received his prize during the 6th Convention on Co-operative Banks held in Brussels on 3rd March 2015.